V Mini was designed to seamlessly and effortlessly integrate with your music software. A single USB connection to your Mac or PC provides both power and MIDI functionality, allowing you to plug right into your computer and start making music. 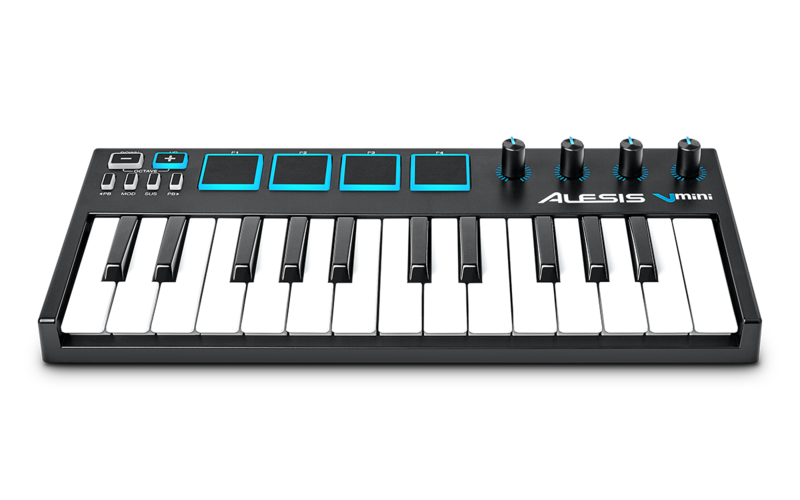 All the knobs and pads illuminate blue to provide real-time visual feedback and are laid out for an intuitive workflow. 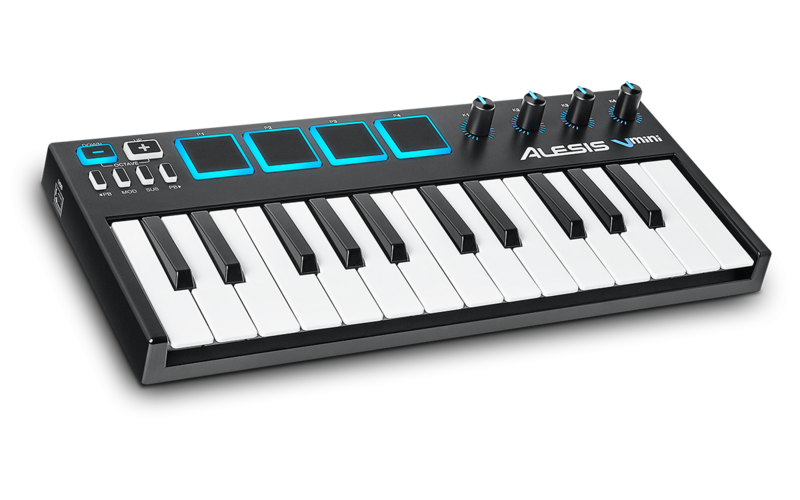 Plus, V Mini's compact design makes it easy to take this powerful MIDI controller on the road or implement it into any sized studio. V Mini is bundled with Xpand!2 by AIR Music Tech. Xpand!2 is an advanced virtual instrument that comes with a collection of over 2000 premium sounds, ranging from acoustic instruments to futuristic synthesizers. This powerful software allow you to create or perform music with V Mini right out of the box. As featured on our VX49 premium production controller VIP is now available for all our popular keyboards. Experience expanded control of your VST instrument and effect collection with VIP 3.0 (a $99.99 Value) for just $29.99. VIP3.0 provides you with unparalleled access to your virtual instrument and effect collection, seamlessly integrating the hardware / software experience and grants the unrestricted freedom to create in a user-friendly, intuitive format. 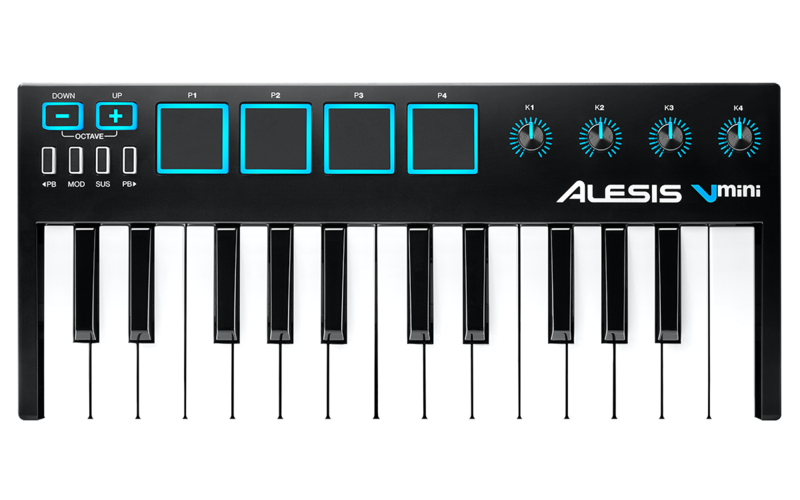 The combination of VIP and your Alesis Controller maximizes workflow and ensures a playing experience that feels natural and enhances creativity – the natural, tactile feel of hardware fused with the unrivalled processing capability of virtual Instruments. Quickly find sounds based on instrument type, timbre, style or articulation from your entire VST library; sculpt immersive, expressive sounds and textures layering up to 8 separate instruments and patches per VIP instance; load up to 4 different VST effects per instrument channel to sculpt the perfect sound; put power into your performance with Pad Chord Progressions and user-friendly Key Control processors; and much more. From live performance to studio production, VIP’s user-friendly functionality coupled with a diverse feature set guarantees simple, seamless integration into your existing setup and provides the ultimate platform for unrestricted creative expression.